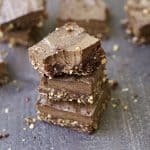 Super easy fudge-y dark chocolate brownies that will make you forget about any other brownie recipe! A recipe that is sure to become a new staple! No kidding when I say: THE BEST. I know you’re probably thinking where is the salted caramel or pretzels, or chunks of peanut butter swirled in with butterfinger pieces and topped with Nutella? Nope. Not here. 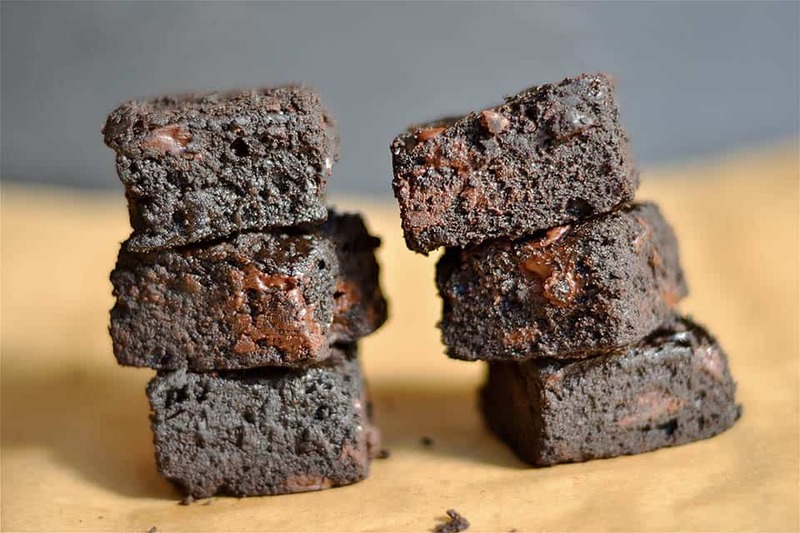 Just plain old delicious and perfectly baked Dark Chocolate brownies. I wasn’t going to even post this recipe, as this recipe contains butter and refined sugar…..GASP……. But you know what? I love them, and so does every person I make them for. So they are not my refined-sugar free, gluten-free, and Paleo concoction (I have plenty of those too). 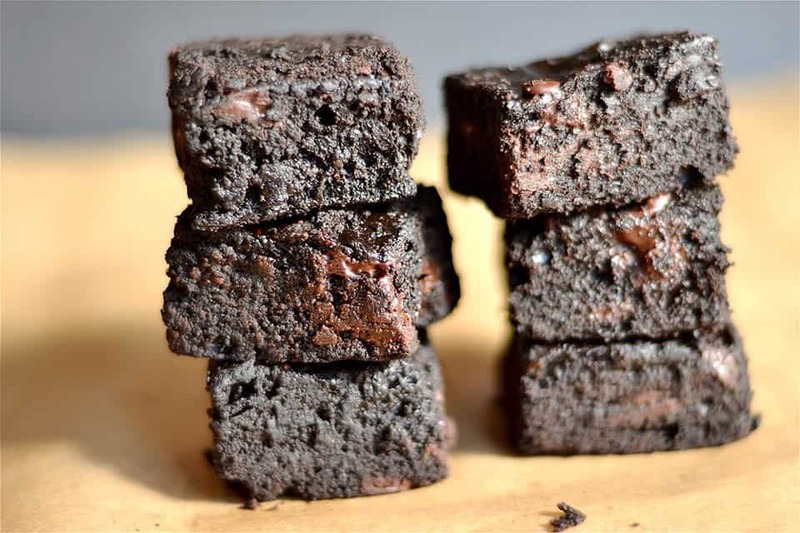 These are my tried and true brownies that I make often for special people. And honestly, I needed a link to share with everyone who asks me for the recipe. It was time. Being the chocoholic that I am, I have tried so many different variations of brownies over the years. This is my recipe I go back to ALL. THE. TIME. 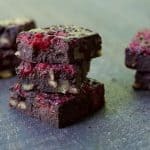 It tastes way better than any boxed brownie (tried them all), and they are just as easy. 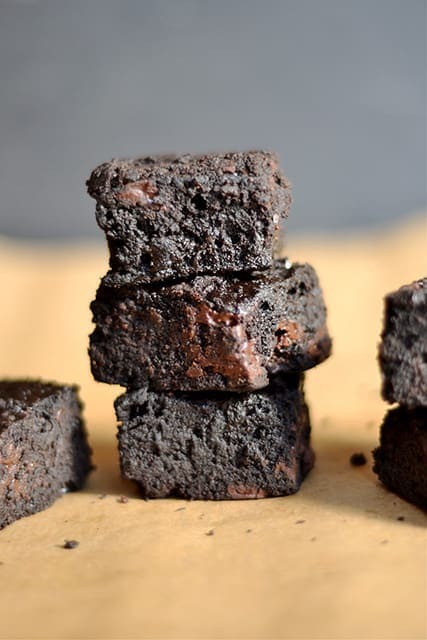 I promise that I have converted friends who were die hard (insert brand of boxed brownies here) fans, and have completely ditched the box for this recipe. 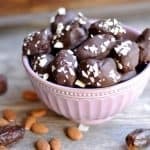 They are perfectly thick and moist, just the right amount of sweetness, and have dark chocolate chips that give it that final ooey gooey chocolate punch! These will make a pretty large batch that will feed many people. 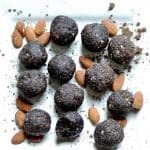 If you want to be a bit selfish and not share (I might do this from time to time), put them in the freezer and they will stay fresh for months. Not that they would ever last that long. But just in case you need them out of your sight to avoid temptation, the freezer works perfectly. Preheat your oven to 350 degrees. Lightly grease a 9x13 pan and set aside. In the microwave or a saucepan, melt the butter and sugar and mix until well combined. Make sure the mixture is slightly cooled, add eggs one at a time, and finally vanilla. Whisk until well combined. Set aside. In a large bowl mix together the dry ingredients: dark chocolate cocoa powder, flour, salt, and baking powder. Fold in wet ingredients and mix until the dry has been completely incorporated. Add dark chocolate chips and pour batter into the 9x13 pan. Batter will be thick and need to be smoothed with a spatula. Bake for 25-27 minutes, or until a toothpick inserted comes out clean. Let brownies cool before cutting into small pieces. Brownies should be stored in an air tight container for up to a few days, or frozen for a few months. As soon as I saw this recipe in your weekly email I knew that I had to make it! 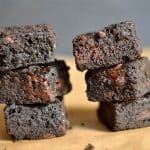 These are truly the best brownies ever. Everyone I shared them with is obsessed! Woohooo!! Aren’t they perfect?? So glad you loved them Carly! Are they supposed to be dry? I followed the recipe exactly and even though the flavor is good, I found that they weren’t moist and slightly cake-y. No, they should be moist and not dry. It could be a difference in your oven?? I make them all the time and the only time they turn out dry is if I cook them a few extra minutes too long (sometimes I forget to set a timer). I put that 25-27 minute range because it’s different for everyone’s oven or altitude. Sorry they didn’t turn out! But I would bet if you made again, and cooked for a few minutes less they would be perfect.